Sentry Electronics Labs switched security door handle is for commercial, panic exit, and security exit doors. This Sentry Electronics Labs Switched Lever Handle is a secure and versatile accessory. 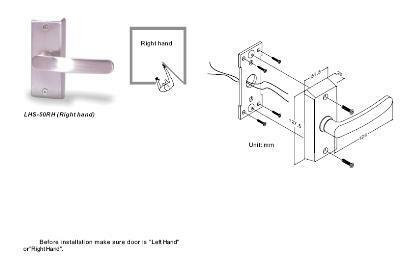 The advanced design makes this handle a secure accessory for any door - it is built with N/C (normally closed) and N/O (normally open) contacts for compatibility with many security options, such as keypads, card readers, electromagnetic locks, and electronic exit bars. This model is also versatile because it is available in left-handed (L) or right-handed (R) options so that it can accommodate the design of any door.